Mexico is not typically thought of as a “motorcycle country,” but the Acer Mex Company began building motorcycles in 1960. Mainly built for the U.S. market, the Mexican Carabela shows typical Italian lines due to the fact the factory enlisted the aid of technicians from the Italian Minarelli Company. 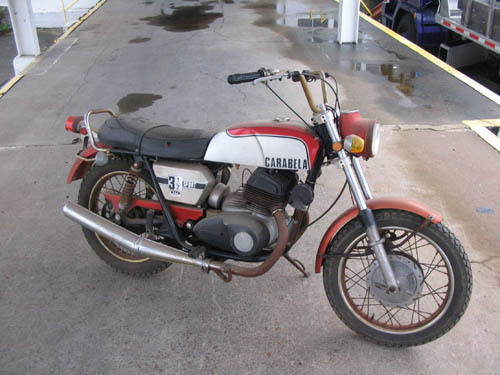 The Carabela motorcycles were primarily for day to day transport but then began offering sportier models for use in motocross trials and Enduro. Earlier models used European engines from Jawa, Minarelli, and Villa. However, the company was not content importing components from abroad and gradually began manufacturing components in their own factories. By the late 1970s, more than 80% of their components came from home plants. The machines were well made and offered respectable performance. 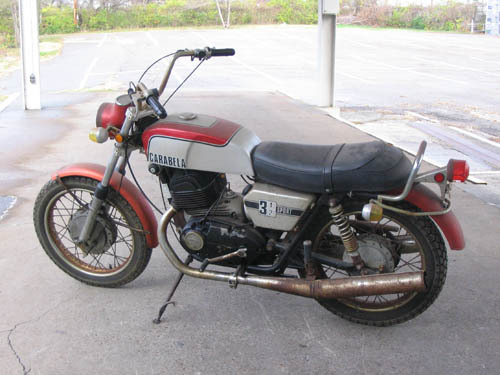 The 350cc 3 1/2 Sport you see here is one of the twin-cylinder machines–one of the largest capacity Carabela road bikes.